Logan's choices of food are very limiting, so in order to make sure he gets the nutrients he needs I have to be very creative with sneaking food into the dishes he already likes. 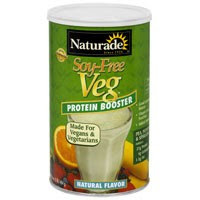 I recently discovered Naturade Soy Free Veg Protein Powder. Logan at age 2 decided he was a vegetarian. Zane was just a baby in the highchair and I was feeding him a hard boiled egg for the first time. Logan was very curious about what Zane was eating. So I told him that Zane was trying an egg and then asked if he wanted to try it. He shook his head "no". A few moments later I look over at Logan and he has tears welling up in his eyes, his bottom lip is quivering. Allowing the tears to fall he says ,"Birds come from eggs and eggs come from birds. Zane is eating a bird!" A full crying session followed. And that was the moment, from then on we have a vegetarian on our hands. I will admit that because his diet is so limited we have fed him meat but called it other things. For example we called fish sticks "crunchy sticks", but while Grammy was visiting us in Seattle she called them fish sticks and Logan went to bed crying "I don't eat Nemo!". I tried the protein powder by adding in 1/3 cup into his pancake batter, along with extra water. It mixed up well and there is no taste to it so it went completely unnoticed. YAHOO! 1/3 cup is 22 grams of protein. I now put it into everything, pancake batter, pizza dough, bread dough in the bread machine. It's vegan and vegetarian friendly and it also provides 100% of the daily value of B12, plus 8mg of Iron and 150mg of calcium in every serving. B12 is something that is always lacking in a vegetarian diet. If you or your child needs an added boost of protein I highly suggest this powder, and also if you don't like it the company has a 100% product guarantee, for whatever reason.